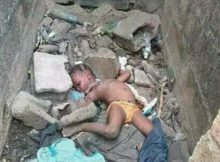 A young girl has been reportedly stoned to death by her step mother in Wadata area of Makurdi, the Benue State capital. The yet-to-be-identified infant, believed to be four years, was killed by her step-mother for reason yet to be ascertained. According to a source, the suspect allegedly conspired with two others now at large to stone the little girl to death. Confirming the development toDAILY POST Thursday evening, the Benue State Police spokesman, Moses Yamu said the suspect had been picked and she confessed committing the alleged crime. Asked what was her reason for stoning the little girl to death, Yamu said the suspect claimed she was under strange influence. “Yes, we got the report about the lifeless body of an infant discovered in an uncompleted building around Wadata on Wednesday and we went there to retrieve it. “On reaching there, some residents of the area accused the step mother of being behind the dastard act. Our men picked her up and she confessed conniving with others to commit the crime. “She is currently in the police custody and search for others involved in the act is still on,” Yamu added.